Thanks to heavily lobbied-for changes to laws governing debt collection, student loans don't vanish after the loan holders declare bankruptcy. Nor do they vanish when the loan holder dies. Some loan companies have policies in place that erase student debt accrued by a deceased person; others do not. And the ones that do not subject grieving families to all matter of fuckery. Because law school is expensive and Andrew Katbi's family wasn't in a financial position to cough up the six-figure cost of his Duke Law School tuition out-of-pocket, Andrew did what most post collegiate students do: he took out loans. And because he was a young man without much credit history, those loans were cosigned by his mother. In late March of 2013, just weeks shy of graduation, the 24-year-old was killed in a car crash, leaving behind two devastated parents, a devastated girlfriend, and a devastated sister named Olivia. Two of the companies that serviced Andrew's loans — Citi and Discover — immediately forgave the loans, "no questions asked," even though those loans didn't have a forgiveness upon death clause, according to emails I exchanged with Olivia earlier this week. But one — Sallie Mae — insisted on harassing Andrew's grieving family for months in a Kafkaesque nightmare quest through the company's chaotic bureaucratic labyrinth. After sending certified mail affirming that yes, Andrew had died, Sallie Mae helpfully rolled the entire balance of the loan over to Andrew's mother's name. Hours on the phone with a "Customer advocate" were fruitless; when Andrew's frustrated father told Sallie Mae employee that the Duke community was on their side, the customer advocate suggested that if Duke loved Andrew so much, then maybe Duke should pay off his student loans. Every night, a phone call, a voicemail. This message is for Andrew Katbi. This message is for your loved one who died before paying us back the money we paid for an education that he'll never be able to use. Finally, after listening to her parents once again spend 2 fruitless hours pleading with Sallie Mae employees, Olivia reached her wit's end. Frustrated and enraged, Olivia took to Twitter, hoping that hammering Sallie Mae on social media would garner enough attention that the company would be shamed into backing off. At one point, Olivia Tweeted, "This is now strictly a Sallie Mae hate account. Unfollow accordingly." But people didn't unfollow; they started paying attention and responding with stories of how Sallie Mae screwed them over, screwed their friends over. The PR nightmare tornado didn't just induce one massive internet headache over how fucked the whole story was; it roused the loan giant to action; yesterday, Olivia tweeted that they'd been contacted by Sallie Mae and reached a settlement, but that's all that she could legally say. So what happened to Andrew's loans? Will Sallie Mae leave the Andrew Katbi's family alone? I reached out to an attorney who handles cases like this, and she confirmed that this sounded a lot like a standard settlement/confidentiality agreement situation. Whatever the specifics of the settlement were, they were enough to convince Andrew's family to stop talking to the press about it. Say what you will against shaming; when it comes to uncaring business behemoths, I am 100% on Team Shame The Hell Out Of Them. Sometimes, shame or the threat of shame is the only effective tool to spur action from otherwise indifferent corporate entities, and if a Twitter fit is what it takes for borrowers to assert any power, then more power to Olivia and her family. But that isn't how things should be. A decent company would try, as a matter of course, to do the decent thing. Not leave dozens of voicemails requesting a call back from a man being grieved over. 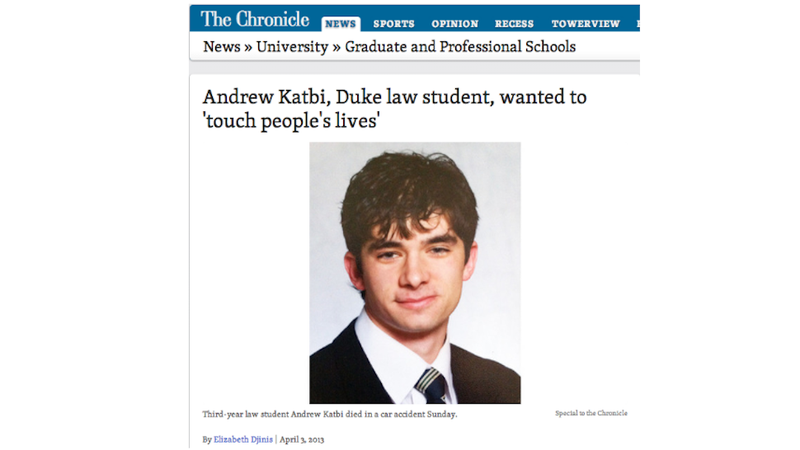 If you're interested in contributing to the Class of 2013 Andrew T. Katbi Memorial scholarship Duke Law set up, click here.